I once travelled with a guy who kept the same journal for almost a decade. He’d tape additional books together and write in tiny script. This impressive travel diary was his Bible, an invaluable historical record of his complete life adventures. It was stolen, along with his backpack, off the roof of a bus somewhere between Transylvania and Budapest. What the hell does this have to do with Victoria Falls? Well, I once had a journal, and it contained the most incredible photograph of me jumping off the very lip of the world’s largest waterfall. Twice the height and width of Niagara Falls, more water falls into the chasm dividing Zambia and Zimbabwe than anywhere else. It’s not the world’s highest waterfall (that’s Angel Falls in Venezuela), nor even the widest (that’s Khone Falls, Laos). Yet the sheer volume of the mighty Zambezi has attracted Bucket Listers for centuries, drawn to a place the locals call “the smoke that thunders”. Traditionally, most tourists to Vic Falls stay in colonial hotels on the Zimbabwean side, but with the country’s political and economic collapse, many now prefer the Zambian side. Hotels and tour operators in both countries are known to gouge their guests for the privilege of seeing this natural wonder, including a day-visa which allows you to cross borders for the views, at a price of around 40,000 Zambian kwachas, or ten gazillion Zimbabwe dollars. Actually, Zimbabwe’s currency was abandoned altogether, rendering all its notes worthless. Inflation reached 89,700,000,000,000,000,000,000% in 2008. And I didn’t even make that number up. 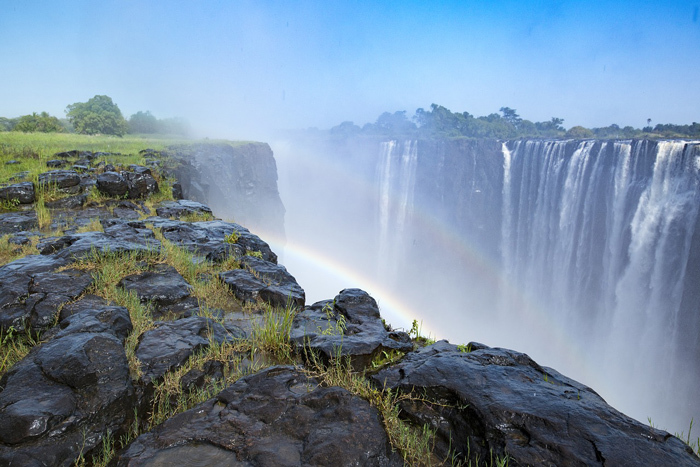 In both countries, where the US greenback goes very far, you’ll pay up to $80 just to see Victoria Falls. No more bitching about prices to cruise under Horseshoe Falls in Niagara. I visited the Zambian side in December, the tail end of dry season. With the Zambezi flowing at low volume, you can walk to Livingstone Island, and then make your way to the Devil’s Pool. Here, a rock barrier creates a pool right at the very edge of the falls. 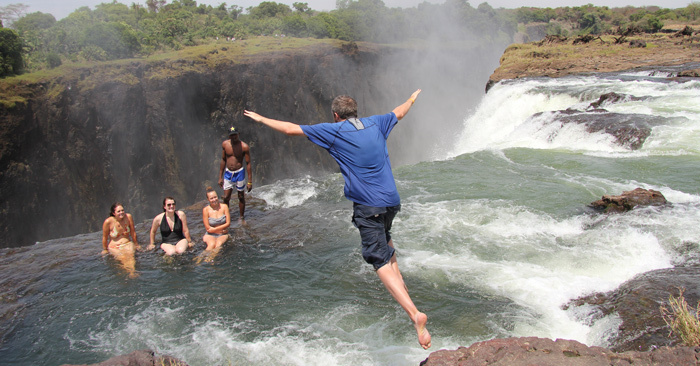 Much to the horror of tourists on the Zimbabwe side, you can even go rock jumping. Across the chasm, tourists can’t see the pool, and must therefore watch what appear to be tourists committing suicide. This close to the edge, you don’t have to worry about crocodiles or strong currents, although the occasional tourist has gotten a bit overzealous, missed the pool, and found themselves visiting Zimbabwe without a visa, or a heartbeat. If swimming to the edge of the world’s largest waterfall isn’t enough of a thrill, you can also bungee jump 111-metres off Victoria Falls Bridge, once the highest commercial bungee in the world. Or spend $500 a night at the Royal Livingstone, a hotel bill that is sure to give you a heart attack. Zimbabwe is a country with abundant natural resources, and a country that once promised much hope for sub-Saharan Africa. Unfortunately, a corrupt, crackpot dictator bled it dry. A common joke: Where is the capital of Zimbabwe? Geneva. I’d love to illustrate this post with an epic, once-in-a-lifetime photo of me rock jumping into the Devil’s Pool. We set it up so it looks like I’m actually leaping off Victoria Falls itself. Unfortunately, much like Zimbabwe’s economy, that travel journal mysteriously vanished, along with the photo in question (and so many more), the writing, and contacts of new travel friends. It pains me to even think about it. Fortunately, you’ll never forget Victoria Falls, even if you do lose your journal. Nor should you forget any of the Bucket List adventures on this site, although you might want to keep an online blog and back up your photos all the same.